Standing on a wooden dock watching muddy, sediment filled water swirl past me, I reflected on how thankful I was to be a temporary visitor to this land of amazing and endangered animals. 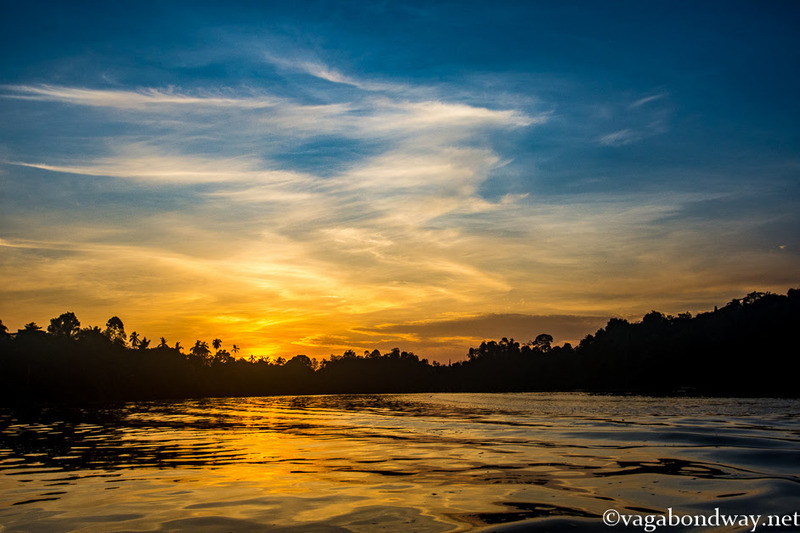 My husband, Chris and I spent a week along the Kinabantagan River in Borneo, Malaysia. Drinking coffee and eating fried bananas at our lodge I felt like I was living in a real life documentary. If you enjoy viewing wildlife or have ever wanted to experience river cruising as the main method for spotting wildlife, this is the place to try. Most of the surrounding landscape has been cleared for palm oil production. The result is the very limited amount of rain forest left borders the river, thus forcing the animals to congregate near the shore banks. 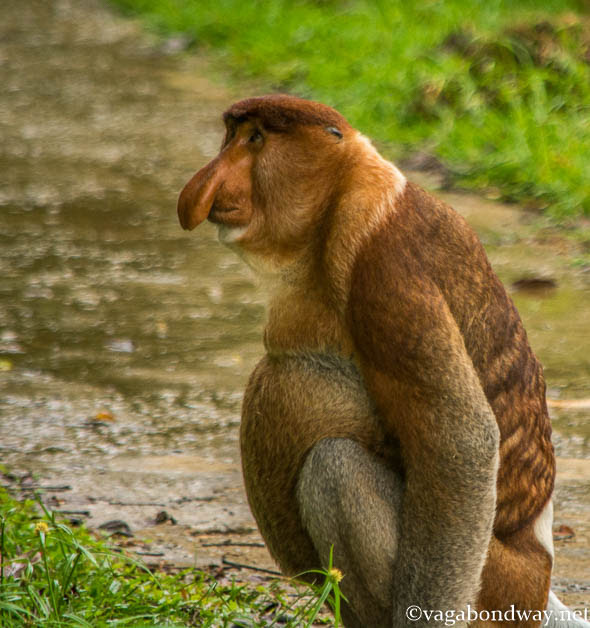 Although animal sightings are never guaranteed, there is a very good chance you can see some endangered animals unique to Borneo if you visit this area. We spent over two months exploring Borneo, Malaysia extensively. If you also wish to see wildlife in their natural habitat, book your plane ticket to Borneo and start preparing. In the meantime, here is a sampling of some of the animals we saw. More often heard than seen, hornbills crisscrossed over the river. Hornbills can actually be quite difficult to spot as they tend to hang out in the tops of tree. 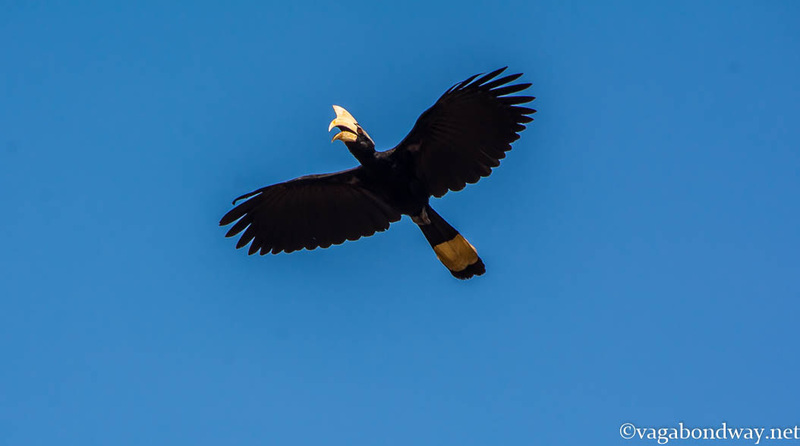 Countless times I could half see a hornbill fly right over me, land in the canopy and have no way to actually see the bird. When they fly, their wings make this whishing noise that sounds like a mini UFO flying overhead and you are lucky if you catch a good glimpse. These red leaf monkeys were hanging out in the trees right outside of our B&B. They are endemic, or naturally found in Malaysian Borneo and Indonesia. After a while this baby got brave and went off racing through the treetops and would then hurry back to mom. 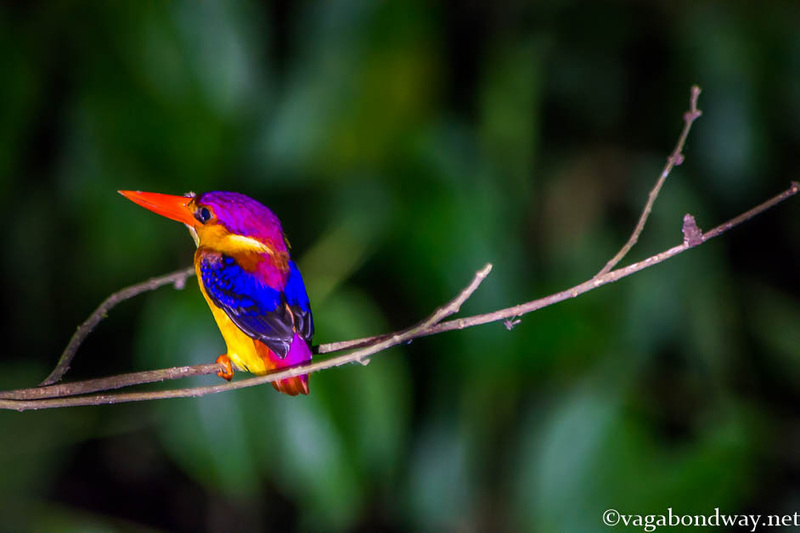 Bright and vibrant, this rufous king fisher darted through the forest. Acutely accurate, they will hang out on a branch just over the water. Their eyes can see through the murky brown water and when prey is spotted, they will dive down into the water so quickly that you can miss it in the blink of an eye. 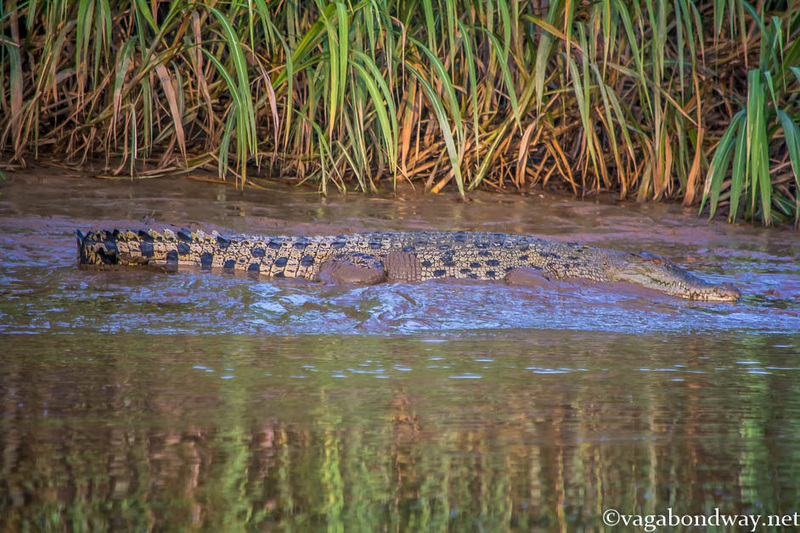 A slightly bigger predator but also easy to miss due to its ability to be extremely camouflaged, this saltwater crocodile basked on the shore. Wary of humans, these guys would waste little time to slip themselves back into the water and seemingly disappear below the murky waters. Aptly named for their short tail, these Pig Tailed Monkeys only made their appearance once for us. 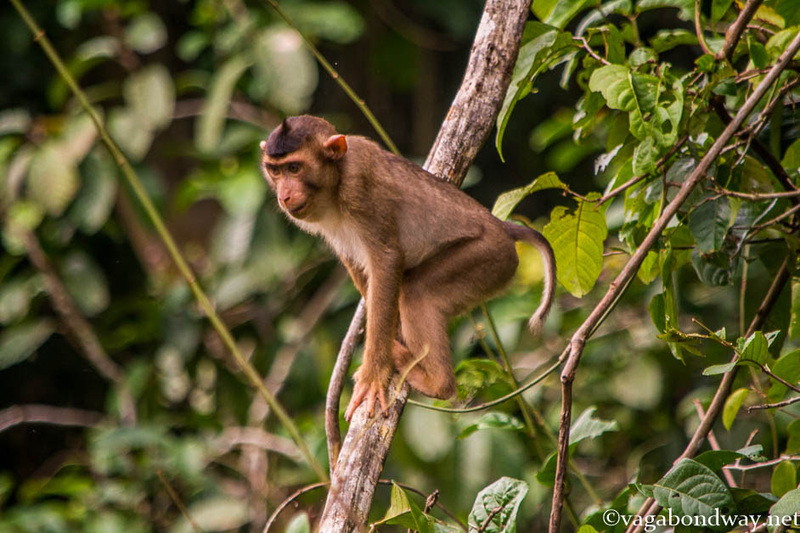 A medium-sized monkey with a stocky build, they have a brown coat with a lighter underside that can be seen as they move through the forest. 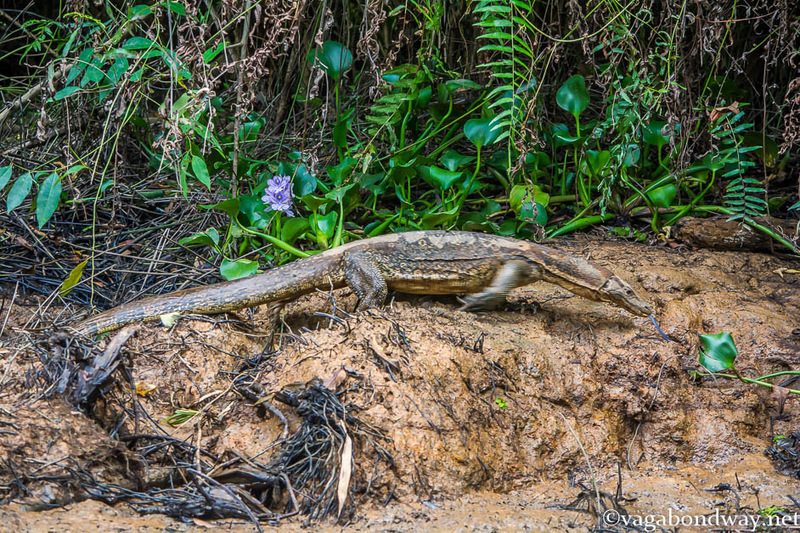 With impressive size, this monitor lizard was walking along the muddy banks. Monitors lizards are common to see, although to see one this big is rare. This photo was taken from a boat, but these monitors needn’t be feared, only respected. Any monitor lizard I have ever come across has always been very afraid of humans. 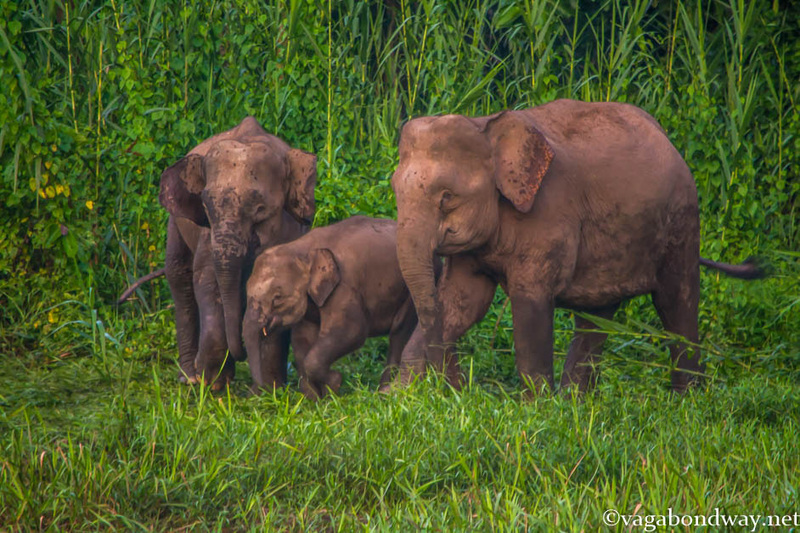 One of the icons of the Borneo rainforest, a herd of 30+ pygmy elephants passed through. We did not realize it at the time, but we were very lucky to have such good sightings of elephants. Elephants will move around the area, crossing back and forth over the river as they graze and continuously look for the best feeding grounds. 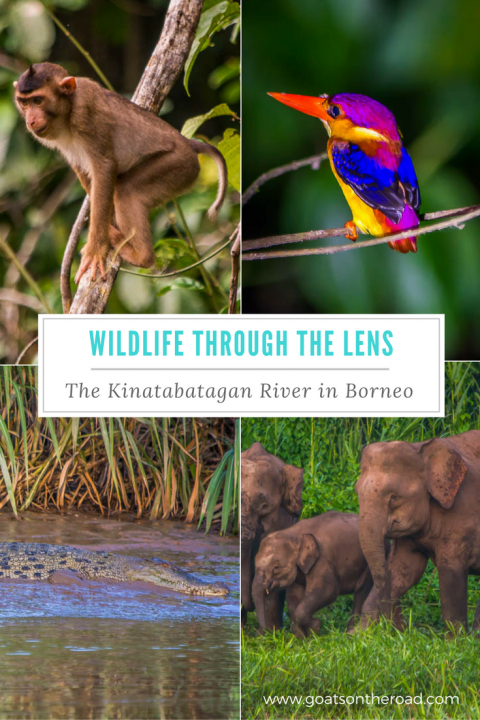 Spending time along the Kinabatangan River was one of our highlights of Borneo and seeing this wildlife was a lifelong dream fulfilled. I can remember watching National Geographic documentaries talking about these unique animals and finally I was able to see them first hand. That is what the power of travel does for us – it allows us to take ourselves to places we had previously only ever dreamed of. 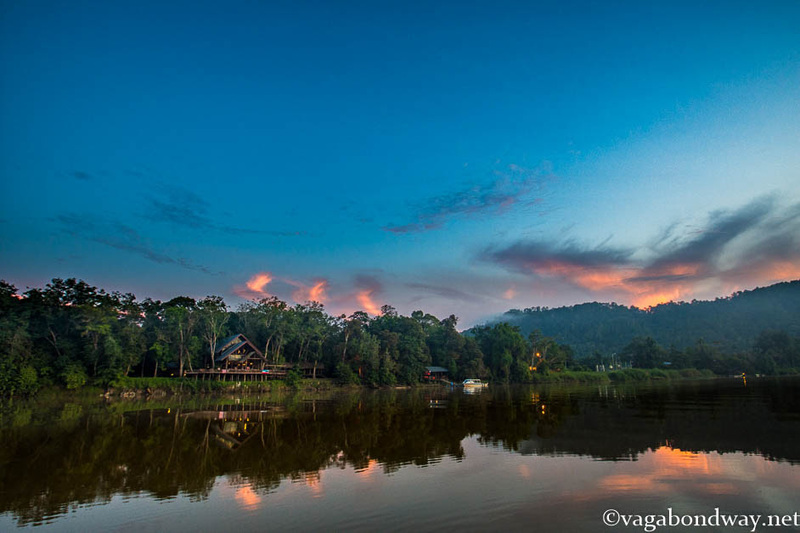 We stayed at two different places along the Kinabatangan River. We first opted to go on an organized tour with Nasalis. When we got to Kota Kinabalu and walked around town, so many of the offers were crazy expensive. Nasalis had the best deal running at $428 RM pp 3D/2N. 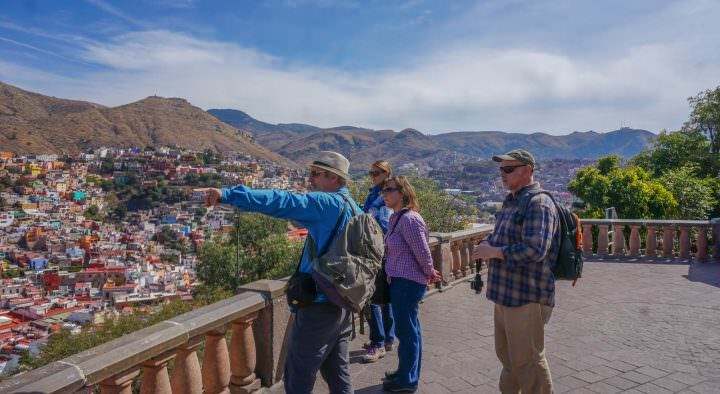 This included four river cruises, two night walks, all your meals, transport and accommodation in a four bed dorm (you could always upgrade if you want.) For our initial two nights we did this and were very pleased with them. I don’t know if the promotion is long running, but at least that gives you a base idea. After our stay with Nasalis at Nature Lodge Kinabatangan we went further down the road and stayed at Greenview B&B. 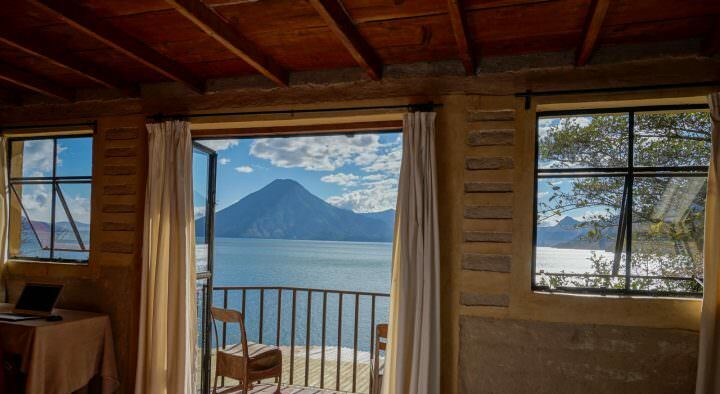 This was, from what we found, one of the best budget options along the river. For a nice private room with bathroom and AC we paid ~$30 USD per night. Most other lodges along the river were a lot more than this. The folks at Greenview were so nice, the room was clean, good AC, hot shower and there was wifi at the dining area. Cruise prices were $60RM pp and could either do early morning, afternoon or night cruise. We did all of them because different animals are active at different times. 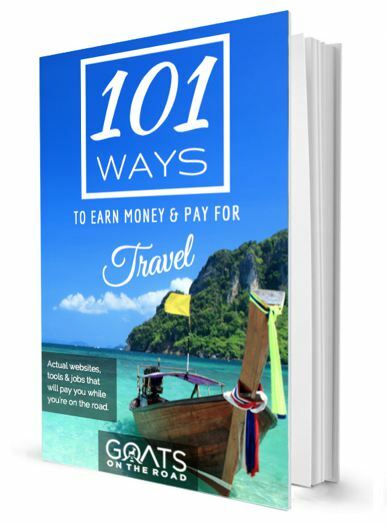 If you are going on multiple cruises, ask the office because they will likely give you a discount. They also had trekking and night hikes on offer, but we didn’t do any there so I can’t speak to that. There are multiple other small restaurants nearby and a great way to spread the tourist dollar around by supporting them as well. There were also a good number of homestays along that road. If this interests you, check out the Tourism Malaysia directory. 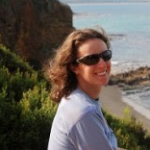 If you go this route, I would book 1-2 nights to make sure you enjoy the homestay you are at. If not, then you can move somewhere else, and if you like it you can extend your stay. For transport, Greenview will bring you out to the end of the road for $25 RM pp. You can grab a bus heading north back to Sandakan or south to Semporna. If you know the day before, the office can book your ticket to Semporna. If not, just get any bus to Lahad Datu ($10 RM) and from there get a mini bus to Semporna for $25 or $29 RM. 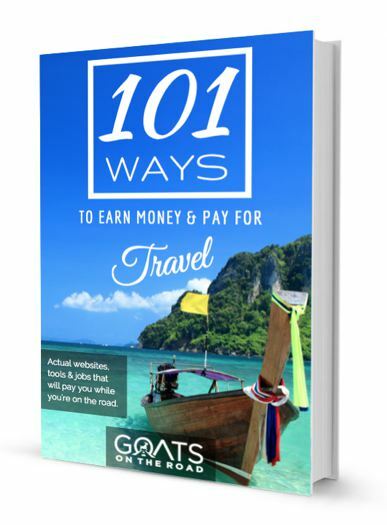 Also, it’s worth mentioning prior to going to Borneo, I had no idea what our daily budget would be to have some of these wildlife experiences. In the month of July we spent 26 of 30 days in a national park and still managed to keep a budget of about $26 USD per person. You can check out the details here if you are interested. Wow!! It really interesting you shared the wildlife-lens. Thank you so much for sharing it. 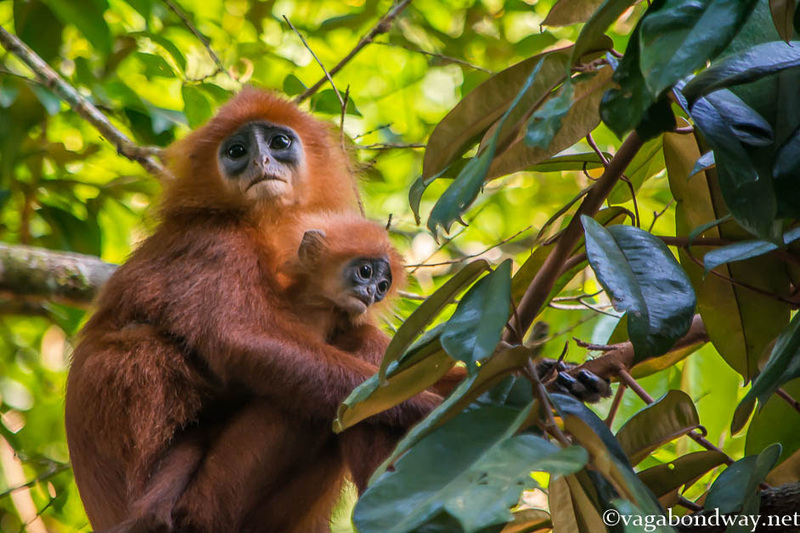 Gorgeous photos of Borneo and some scarce wildlife! The travel info is nice to have too! Thank you Vagabondway. Thanks for the compliment Jim! We were so lucky with some of the photo opportunities we got. We were so thankful to be able to spend that time there. This is sooo great! damn…i love wildlife experiences like that. Had a blast in the amazon rainf orest but never been to borneo. thx for sharing!